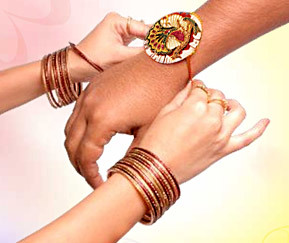 Raksha Bandhan or Rakhi is a festival of brothers and sisters in Hindu religion. Raksha Bandhan is a Hindu festival. It specifies the love between brothers and sisters. It is also popularly used to celebrate any brother-sister like relationship between men and women. It is also known as Rakhi Purnima or Rakhi. Rakhi is just a thread but it is considered a sacred thread of protection that defines the love and affection of a sister for her brother. It is celebrated in the month of Shravana according to Hindu calendar. There are many myths and historical events which are associated with this festival. According to Indian history, Maratha and Rajput queens sent Rakhi even to Mughal kings so that they can get the help and protection at critical moments. According to ancient Puranik scriptures, it is said that king Bali's stronghold had been the Rakhi. A couplet is usually sung at the time of tying the Rakhi. Rakhi also symbolizes all aspects of protection of the good from evil forces. It is also a legend that Krishna advice Arjuna to tie a rakhi on his wrist to guard himself from impending evils in Mahabharata. This festival is totally dedicated to love and affection between brothers and sisters. On this day, sisters paray for their brother's long life and ask God to help them in critical time. In return, brothers give them inticing gifts and promise to care lifelong. People in different area follow certain custom and tradition to celebrate Raksha Bandhan. The festival of Rakhi has a very impressive significance worldwide. It is a festival of love and affection. It spreads love and harmony and binds the family members in a knot of love. Rakhi is bond of love between brothers and sisters that they have share since their childhood. It is an ancient festival but people even celebrate it with great enthusiasm to strengthen the bond of love between brothers and sisters. It is a gazetted holiday in India. Schools and colleges are closed on this occasion.